Top-Rated SellerBeautyforAshes consistently earns high ratings from buyers thanks to fast shipping and excellent service. Depending on the items, if customer is dissatisfied for any reason, we ask that they communicate to let us know so we may come to a good solution for all parties involved. Jewelry items in general have a 14 day return policy. 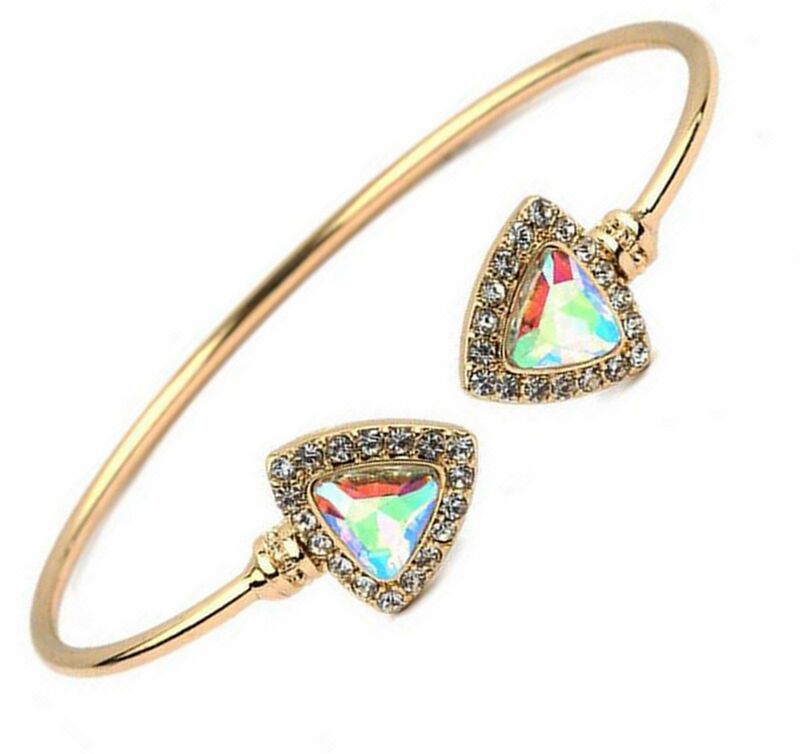 Beautiful Triangle Crystal Ab Cuff Bracelet This is the perfect bracelet to add to your collection! Aurora Borealis Crystals in a triangular shape surrounded by clear micro crystals in clear - on a slim gold tone cuff band. Spectacularly beautiful! Visit seller's Store: Beauty for Ashes Boutique Always new items added, check back often! Shipping Payment USA First Class shipping (2-5 days delivery) with tracking delivery confirmation is 3.95 for one item. \Sign up for my email newsletters by adding my Store to your Favorites Please note: Beauty for Ashes Boutique carries t-shirts, worship flags, clothing, jewelry and accessories; many with our trademark brand name 'Beauty for Ashes' - which means God will restore Beauty in place of life's ashes - Isaiah 61:3. None of our items carry literal ashes. Instead, our items carry the blessings of God representing restoration and divine destiny for each individual.